The Carmen Table Lamp is an elegant and sculptural piece that will light up your space with it’s exquisite details. Inlaid in 3 different materials: black shagreen, black pen shell and blue agate and finished with bronze-patina brass accents. The shade is included in this piece. Custom color/sizing available on request. The finish of the shagreen is authentic as it is hand-dyed and the designer calls the finish look: "antique black shagreen." The dimensions of this piece are 35 x 7.6 x 92 cm / 12.5" x 3" x 21.25" All R&Y Augousti pieces are handmade by artisans, ultimately making each piece unique. Wipe clean with soft dry cloth. Acclaimed design duo Ria & Yiouri Augousti have established themselves since the 1990’s as pioneers of modern-vintage style through their luxurious art-deco inspired collections. The Paris based label has distinguished themselves since their launch, with their iconic use of shagreen mixed with brass and other exotic materials. All furniture is handcrafted by skilled artisans, ultimately making each piece unique. All shagreen-covered items should be kept out of direct sunlight, color variants may occur on the stingray and other exotic finishes, but this showcases the Parisian label's commitment to creating authentic luxurious products using natural components. Brass bullet shell table lamp. Great vintage condition. Table lamp in the style of Willy Daro. 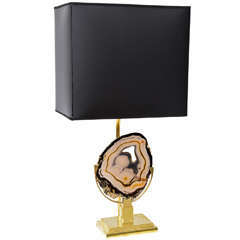 Brass base displaying a finely polished agate. Shade not included. 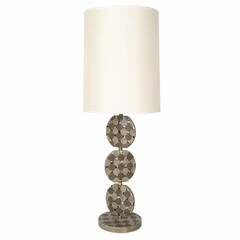 American mission bronze brown patina table lamp with grape leaf silver deposit design on base and natural mica shade with filigree grape vine overlay (Heintz Art Metal).